Cat Hunting skills have never really been lost throughout the process of cat domestication. Your kitty will still feel the need to go out and hunt birds, mice, frogs, in fact anything that is small enough to catch. Cats love toys! It is in the nature of cats to be hunters. So cats are always seeking ways to refine their hunting skills, often through play. Cats enjoy the most simple of toys the best. Anything that makes noise when played with or can be pounced on make great toys. Especially involving movement of any kind. A variety of cat toys, given sporadically, then hidden for awhile so they don’t lose their novelty is a must for indoor cats. Toys don’t have to be expensive, either. Most cats love to chase wadded up aluminum foil, and chomp on plastic drinking straws. You can try hiding your cat’s favorite toys before you leave in the morning, and create a sort of “treasure hunt” for him, which will engage his love of the hunt. 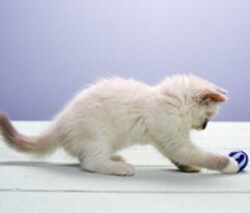 A special new toy with fresh catnip will often keep your cat entertained for hours. Many cats also enjoy climbing in and out of small cardboard boxes. If you have a small stuffed animal you are willing to sacrifice, especially one with legs and a tail, you just might find your cat adopting it and mothering it!! A good rule of thumb with toys is to always have a toy for “babying”, a toy for “killing or stalking” and a toy for “carrying” at any one time, rotating them for variety. Many happy hours are spent hiding and stalking prey and then pouncing and chasing the prey around. All of this is for homing in on their hunting skills.